The fact of the matter is that when it comes to gold and silver, you can be right in your investment thesis for a long time until you are rewarded with serious price appreciation. When all the most powerful tools of banks (both central and not) are brought to bear in an effort to keep a risk asset bubble inflated, investing in precious metals requires serious patience. John Hussman, a brilliant Ph.D who understands this phenomenon perhaps better than anyone, called previous bubbles and their subsequent crashes with spectacular accuracy. But he has been warning of imminent risk this time around for years. By his own admission, it looks like he's been crying wolf, and now he's left to figure out why markets haven't crashed yet despite unprecedented overvaluation and excessive debt. In short, he deduced it was the Fed: "Once interest rates hit zero, there was simply no such thing as 'too extreme.'" Mass delusion, total insanity, the pursuit of yield and return as if 'risk' was not a relevant concept at all anymore...these dynamics define the current investment environment. Which is not to say that will last. Hussman sees a decline of 70% or more in the offing. A stupendous crash. But when? He doesn't know. Clive Maund's analysis is sound and well-reasoned. But gold and silver have both moved sideways in a relatively small range for four straight years. When the next stock and bond market crash comes, physical gold and silver should be among the foremost beneficiaries. The fear and panic trade, the flight to safety, could drive parabolic price action. But nobody knows exactly when that will be. Gold’s breakout from its giant 5-year base pattern has had to wait for the dollar rally to run its course, which it now appears to have done, and this being the case, gold is now free to break out into a major bullmarket that looks set to dwarf all prior ones. For one of these patterns to be valid, volume should build as the price starts to rise out of the Saucer, and as we can see, that is indeed the case, and with the price now being driven by the ascending Saucer boundary towards the resistance that marks its upper boundary, breakout looks imminent. 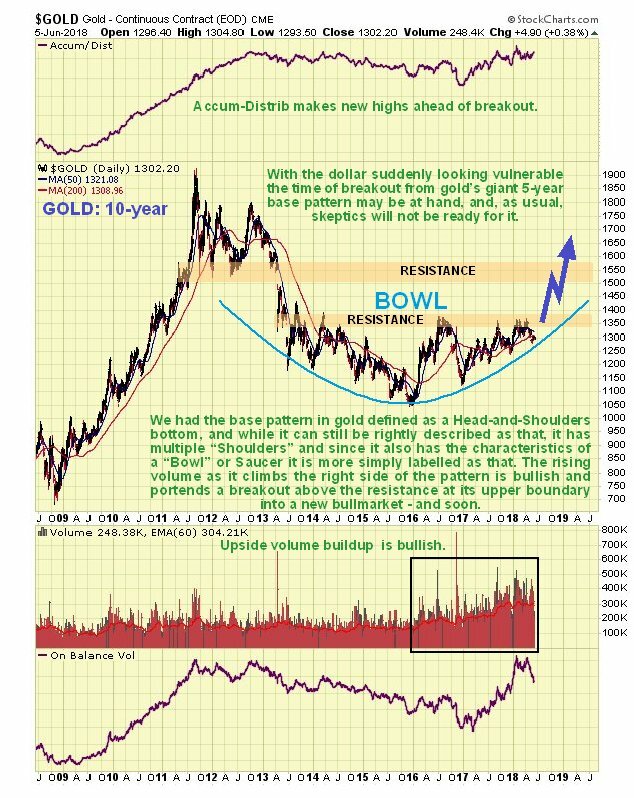 If we stop and think about the growth of debt and money supply whilst this giant base pattern has been building out, it is clear that gold has a lot of catching up to do. 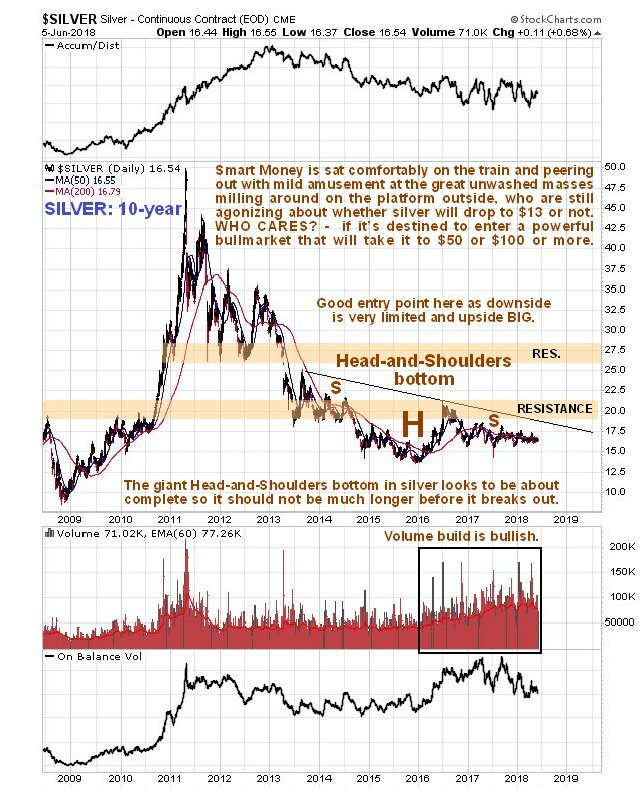 For 5 years now, since 2013, silver has been marking out a giant Head-and-Shoulders bottom, like gold, except that in silver’s case it is downsloping because silver underperforms gold towards the end of PM sector bearmarkets, which is normal. This base pattern is mature, as we can see on silver’s latest 10-year chart below, and with the Right Shoulder close to complete, the time for silver to advance out of this base pattern is at hand, and thus it is viewed as no coincidence that the dollar, which we look at in the parallel Gold Market update, is rolling over and looking set to drop.